We are continuing today the series of lessons on 'If clauses' or conditional sentences, by looking into the conditional II type. Please find the lesson on this topic outlined on the Conditional II page. There is no exercise for this lesson (yet...), but I hope you find it useful in your English practice. A more versatile part of speech is the preposition. Today I prepared a lesson about this on the Prepositions page. As a student of English, for you to master the prepositions well, you do need constant practice and abundant use of the language. Since we're at it in the grammar section, well... let's also have some fun with the prepositions. One may think that practising is boring and I'm set to prove it can be the other way around. 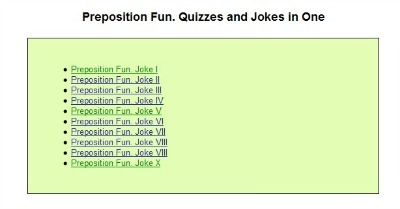 Please find this quiz on the Preposition Fun page. This is a set of jokes with blank spaces for you to fill in the prepositions. I'll try to show you a few of them, to just open your appetite. OK, you can't read this very well, but I chose this pic to show you the format of the joke and the fact that you have two buttons at the bottom of the screen: the check button and a hint button. On pressing the hint button, you'll be offered the first letter of the preposition in the space where you leave the cursor. I'll just givce you the jokes from now on. I found this funny, in a certain way. Not as good as the previous ones, but did you get the prepositions? Having seen some, go and dig the rest of them and see if you can complete them correctly. Find them on the Preposition Fun website. Perhaps this game is not for children and you will also find harsh black humour among the jokes. Nevertheless, please enjoy as much as you can of them and I hope this helps you improve your use of prepositions and your sense of practising with fun.